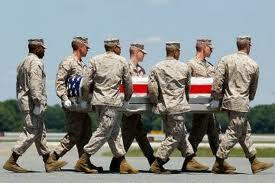 Body parts of troops that were probably shattered and unrecognizable were cremated and dumped in a landfill. That is the story coming out of Dover Air Force Base mortuary. The mortuary in Dover, Delaware is where all remains of U.S. troops come to from overseas. According to the story, this dumping of troops remains in a landfill went on from 2003 to 2008. Air Force officials finally acknowledged this happening from queries sent from the Washington Post. Military officials stated it was similar to disposing of "medical waste." On top of this news, Dover stated it had lost a soldier's ankle recovered from an air crash and, even worse, they sawed off a Marine's arm so he would fit into a casket. The callousness of this report is mind boggling. A soldier's remains have always been thought to have been handled with the utmost respect and care. That idea is completely gone now. This is how we treat our dead warriors? Dumping their remains in a landfill? At one time unrecognized body parts of soliders were placed in the Tomb of the Unknown Solider. Whatever happened to that idea? I realize you couldn't place all the body parts there. Still...it is disgusting to contemplate. It has been a bad week for this country...the sordid news out of Penn. St. and now this report about the dumping of remains of dead soldiers. You get the feeling that things in this country are spiraling completely out of control.